River cruise dining goes big time with its menus. Food is a lure that continues to attract travelers to ocean cruising. The promise of decadent buffets; a panoply of specialty restaurants; gourmet menus curated by celebrity chefs; cooking demos and lessons; and 24/7 cabin service is a hard act to follow. Admittedly, big boats have an edge. Because of size and economies of scale, they offer more of everything — more entertainment, casinos, lounges, pools and different stateroom configurations — as well as more varied foods and dining venues. Riverboats are smaller and more intimate, their size limited by the width and depth of the rivers and locks they cross, the height of bridges, and the size of ports where they anchor. “As you would expect, riverboat galleys are considerably smaller,” said Gregory E. Pearson, a Virtuoso travel adviser with Travelex International Inc. in Hoffman Estates. Yet river cruising is the fastest-growing segment of the cruise industry. According to Cruise Lines International Association, annual passenger totals on riverboats have grown 10 percent over the last five years, with new ships being commissioned at an unprecedented rate. To dispel the myth that bigger is always better, river cruise lines are enhancing culinary experiences for guests, both on ship and on shore. For food lovers, riverboats offer distinct advantages too: Buffet tables may be shorter, but so are the lines. Guests can step off a riverboat close to the center of a town or village to sample local foods and drinks and mingle with locals at restaurants and pubs (either independently or as part of a small-group excursions). Most river cruise lines offer three meals a day: a buffet table and menu of plated dishes at breakfast and lunch, and multicourse dinners with international and local specialties. Menus change daily and generally aren’t repeated. Like oceangoing ships, meals and their presentation are kicked up a notch at welcome and farewell dinners and other special meals. “The quality of food on river cruises is continually getting better and better,” Pearson said. Although attractive and comfortable, dining rooms are less glitzy than those on large cruise ships. During fixed hours, seating is open (as opposed to reserved). Tables are filled first-come, first-serve, and unless passengers are traveling with their family or a posse of friends, they’ll break bread — and likely become fast friends — with new people. Depending on the line and boat, the number of places at each table varies but most tables seat eight to 10 guests. Some passengers “dress up” for dinner, but many wear casual daytime attire. Most river cruises offer complimentary wines and domestic beers, by the glass, with lunch and dinner in addition to free tea, coffee, soft drinks and bottled water, a more generous beverage policy than on many large ships. Premium liquors, cocktails and wines by the bottle are available at extra charge. “Service levels onboard river cruise ships are the same if not better than some of your luxury oceangoing vessels,” said travel adviser Marni Becker of Protravel International in New York, part of the Travel Leaders Network. Food sourcing is predominantly done centrally, but like the big guys, river cruise lines are ramping up efforts to incorporate local, seasonal ingredients and regional recipes that reflect the culture and traditions of the ports visited. For example, in addition to omelets, fruit, cereals, breads and pastries at breakfast buffets, Viking itineraries in Europe include muesli and local cured meats and cheeses — as well as pickled herring and smoked salmon (that reflect the line’s Scandinavian heritage). Another example: On Uniworld Boutique River Cruises, guests get to taste prosciutto di Parma pizza or osso buco Milanese in Italy, Wiener schnitzel in Austria or fresh oysters in France. An industry first: Chefs on Viking Longships grow herbs on the sun decks and invite passengers to help harvest them for dinner. Howard Blount, of Plant City, Fla., remembers a buffet on a Viking Longship as it cruised through Austria. “The chef and crew pulled out all the stops with costumes, live music and table-top cheese, cold cuts and pretzel displays — every Austrian food and beverage imaginable,” he said. 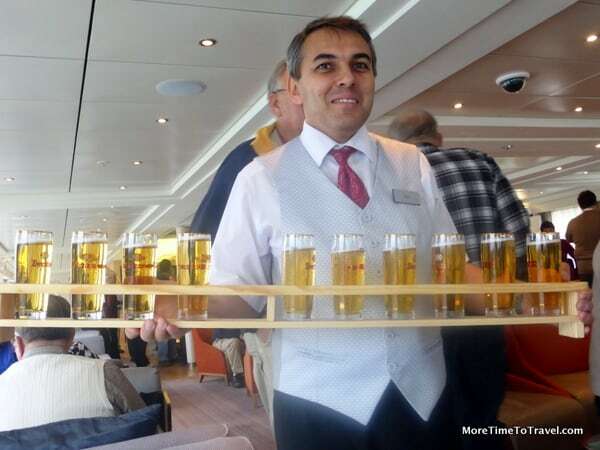 Many lines also hold wine and cheese tastings onboard. Because eating 21 meals (over a typical weeklong cruise) in the same dining room can grow tiresome, cruise lines are experimenting with alternatives. On AmaWaterways, a chef’s table at the stern of the boat seats up to 32 people in an area with an open kitchen and floor-to-ceiling windows; guests experience a tasting menu (available to each passenger at least once during the cruise) that includes paired wines and special desserts. Two intimate wine rooms off the main dining room seat up to 10 for dinner. On Viking, guests can dine al fresco on the Aquavit Terrace or at the Aquavit Lounge, a casual setting with a pub-style menu. On Uniworld, guests can dine in the glass-enclosed Sky Lounge or have dinner on deck under the stars. On its Jewel-class ships, Tauck River Cruises offers lighter fare at The Bistro toward the stern. On AmaWaterways, menus are marked with symbols (e.g., dairy-free, vegetarian, etc.) so guests are aware of ingredients. Most river cruise lines, however, aren’t able to provide Kosher meals. Some itineraries are specifically geared to food and wine enthusiasts. For example, wine-themed cruises on AmaWaterways (hosted by wine experts) feature complimentary lectures, tastings, paired dinners and vineyard tours in winemaking regions along various European rivers. Regular itineraries that travel through food and wine-centric regions (often in France) would win over any food lover. “A river cruise from Lyon to Avignon hooked me off the bat,” said Pearson of Travelex. Viking cruises through the Bordeaux region allow guests to visit the area’s oldest covered market and an oyster farm and to hunt for truffles in the forests of Bergerac. On Uniworld, passengers savor regional favorites, such as duck confit, caviar d’Aquitaine and oysters, and meet with winemakers to learn about regional wines. By special arrangement, on its “A Taste of France” itinerary on the Rhone, Tauck takes guests to Abbaye de Collonges, the restaurant of Michelin-starred chef Paul Bocuse. The line also arranges offshore dinners at spectacular venues like castles and places. On the Viking Mimir, Blount feasted on bratwurst, sauerkraut and mashed potatoes at an authentic German restaurant in the medieval town of Rothenburg. When Rebecca Forstadt-Olkowski, of Los Angeles, took an AmaWaterways Christmas Market cruise on the Danube, she enjoyed holiday favorites like hot mulled wine, gingerbread and chestnuts. On a Uniworld cruise, Viv Chapleo and Jill Hoelting, of Bend, Ore., were treated to Khmer cuisine at a restaurant housed in an historic French building in Siem Reap, Cambodia. Passengers on AmaWaterways Tulip Cruises sample chocolate, waffles and beer in Antwerp, Belgium, as part of an optional excursion. Home-hosted meals (where small groups dine at a local family’s home) offer truly immersive food experiences. Although shore excursions generally are included in the price of river cruises (as opposed to being add-ons on most ocean cruise lines), it may be tempting (and it’s possible) to go AWOL at certain foodie destinations like Lyon or Bruges, and enjoy lunch or dinner at special restaurants. Clearly, key to the popularity of modern riverboats are the efforts being made to cater to culinary enthusiasts who consider food, dining and beverage experiences integral to travel. With the entry of two new Crystal River Cruises uber-luxury ships to the market in 2017, the competition in the galley is likely to grow even hotter. Haven’t done it yet but I would love to try this one of these days, it looks so much better traveling at this level and pace. You would love the ease and convenience, Noel! Thanks for sharing all this terrific information about river cruises. We’re fortunate enough to be going on the Viking Romantic Danube cruise in December and reading all this makes it even more exciting. We’ve done the barge cruising in France and that also is a remarkable experience. In addition to the wonderful onboard food experiences, you’ll love finding culinary treasures in all the cities and villages along the way! Great article Irene. I was blown away by the cuisine on the Uniworld River Countess cruise we took of Venice. Not only did we get to tour the Rialto market with the chef ( and watch as he purchased the food for the day’s lunch) but we sampled so many local specialties I didn’t need to go scouring the restaurants for the dishes on my must-try list. I’ve never cruised on a large ship but was really thrilled with the boutique river boat experience. I have yet to try river cruising. It’s been on my to-do list, but looking at these photos made me salivate…. so I think I’m moving it up closer to the top of my list! Fun! I agree 100 pecent! On the AmaCerto the food was fabulous. One woman in my group is vegan and they did such a great job helping her. I’ve heard many stories of river cruise lines individualizing menus for guests with allergies and intolerances. The food choices sound amazing. I love the idea of being able to get off the vessel and eat in hand picked restaurants in towns/cities along the way. I’ve been playing with the idea of doing a short riverboat cruise when I’m in Portugal this winter, but it doesn’t seem like they run in Jan. and Feb. Looks like I’ll have to wait for another trip that I do during sail season. Oh you make it sound so tempting to take a river cruise. But we are the types who prefer to go awol and I am afraid the rigors of organized outings would drive us to distraction. We had friends who’d never cruised before start with a river cruise and upon their return said they felt like they’d been in a pod – never getting away from their fellow passengers. On the flip side you make it sound like so much fun! Guess we’ll just have to try it one day – as always, most interesting, Irene. One of the nice things is that you can go AWOL whenever you want. It’s just that the tours and excursions are so tempting that they’re hard to resist! The cruise does over the convenience of only having to pack and unpack once and not having to worry about getting from city to city. We are dying to try river cruising. The intimacy and the routes really match up with our desires. River cruise dining as you’ve pictured us only makes us more eager. We have tried ocean liner cruises and have scratched them off our list. I just looked at an 18-day Yangtze River Cruise from Shanghai to Beijing after reading this! We may just try. It sounds like it may suit our travel palate better! Sounds like an interesting itinerary! I appreciate this comprehensive look at dining on river cruises, Irene. It is fascinating that the longboats, for example, are acting more like boutique hotels and local restaurants than they do the big cruise ships. That’s great by me! I don’t do boats- can’t go below in most of them without getting really ill and don’t want to be floating with thousands of people and I don’t do glitz. And while I love being out on water, that would get old for me after a few days of reading. Recently I’ve found myself tempted by river cruises. I like that they’re close to shore if I need to abort and that there aren’t a lot of people on the boat. I also love that they float past historic cities that I want to visit. That they have great food is an added bonus. Great article Irene, I can see why you were recognized by SATW! I’ve never been tempted by one of the big cruise lines, but river cruises, well that’s a different story. Glad to hear they are putting an emphasis on local food. I hope that is a trend that continues. Thanks for the compliment. Hope you have the opportunity to go on a river cruise. It’s a fun way to travel. During the relatively short time we have been river cruising, I’ve already seen a number of enhancements in the types and quality of foods served.